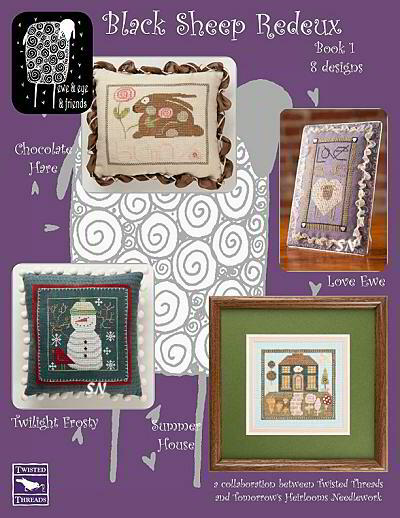 These are beautiful designs that are "Itty Bitty" on size... and "Super Duper" on personality! Ruth Sparrow, the designer has a wonderful color sense, and has designed some of the most charming things! 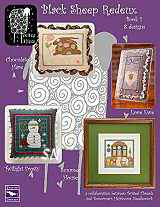 Really creative kits with "Ort Jars," hand-dyed felt embellishments, cool little tin frames... just lots of fun things! If you aren't a 'one over one' stitcher... just stitch these over two... they still look great! 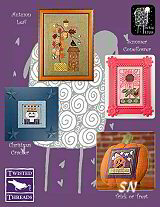 Charts, Kits and itty-bitty cards in the Twisted Threads line... See more of Ruth's design style in "The Trilogy" designs... as she is one of the "3-T" designers! 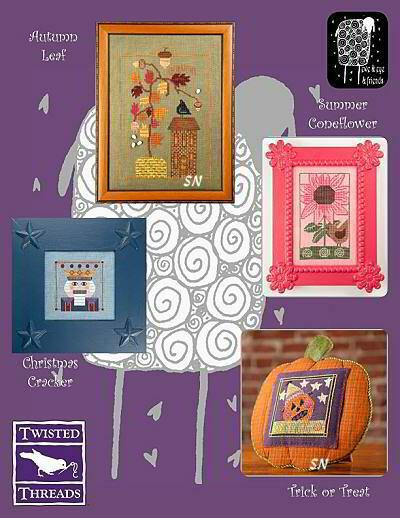 All cute designs, I especially love the Trick or Treat Pumpkin on the Concord Linen. All worked on Week's Dye Works linens with Crescent's, Week's and Gentle Art's hand-dyeds, all 8 charts are in this leaflet. There is an embellishment packet offered separately that includes 4 gorgeous carved Mother-of-Pearl leaf beads, 3 Hematite stars, some stunning flower and insect charms -- nothing cheap or flimsy about these, they are offered as the set for the entire book. The ladies have done a really nice job with this whole collection -- since it's numbered #1 one the cover -- we'd BETTER get more of these! We want them! What a wonderful gift for a new mother! (We have magnifier lamps for sale, to go with this design....!) Only one of a wonderful selection of designs by Ruth Sparrow of Twisted Threads. 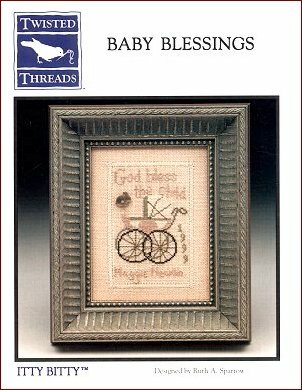 Ruth's forte' is "over one" stitching -- an intricate, detailed cross stitch method. Most of the photographs of her work don't begin to do them justice. 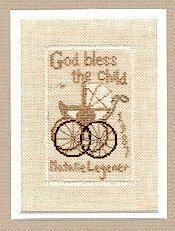 The one at right comes with color choices for either a baby boy or girl, and is shown stitched on 32 ct natural linen.